As you know, Trevor Mallard is a keen cyclist. It seems he touched wheels with another competitor in the R&R sports tour on Saturday. 3 cyclists went down at 40km/hr. Trev broke his femur and shoulder blade. It looks like he’s dealing with it OK. 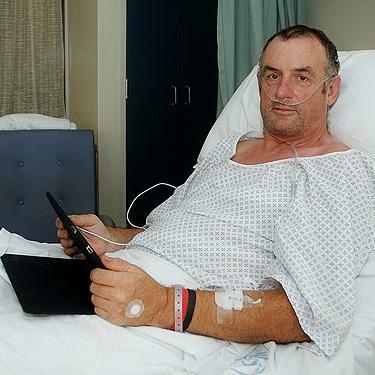 The pic shows Trev on his ipad in the hospital bed, just like Lynn after his heart attack. I wonder if he’ll auction off his cast or the plate in his leg. Maybe he should stick to leisurely rides on the John Key Memorial Cycleway in future. Agreed except he isn’t going to take 10 years… 15 years… never… before he’s fit again. In the meantime, how about lots of meaty posts on Red Alert to while away the tedium. Ideal opportunity to really sock it to em! I hope he’s not absent from the House for too long. Question time will be boring without him. how to have leisurely rides when it is being leisurely built ? Yep. Bloody useful things to have in a hospital for a multitude of purposes. The only problem was that my iPad only has WiFi and there wasn’t any at Auckland Hospital. I had to drop on to the net using the iPhone. But I had a pile of unread short stories and books on the iPad so that is what I was using mine for. Hopefully Trev still has good net access and he gets up and active as fast as I did. Well lprent, you certainly set an extremely high benchmark for posting from hospital beds! I was following a thread of discussion on The Standard, had seen you reveal your identity..then later that day returned to follow up the topic only to read news of your situation, followed by credit to your partner’s first aid skills and to my huge amazement your posts recommenced! Talk about commitment! Being of a medical background myself I did wonder about electrical interference… So Trevor certainly has a hard act to follow! Hope he gets well soon and trust you are well on the mend too lprent. 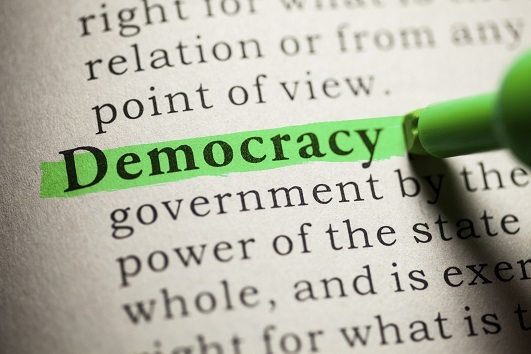 Oh my identity has always been out – you have to be a real person to be the authority of a domain in NZ. I just use lprent because 6 letters is easier to type and was a login from the first time I had one in 1979. I had the attack on the 12th, was released on the 16th (from memory), and was back at work on the 21st. Modern heart procedures are just amazing, and by going back to work I could stop your namesakes anxiety about leaving me on my own (and curtail those infernal ‘social’ visits she was busy organizing). Lyn already had a rather busy month planned before the attack and literally couldn’t take much time off because the start of university semester waits for no lecturer and neither does film distribution tasks*. At work, while being moderately ineffective for a week or two myself, there were people around who could do the required deeds if required. But I’m long back into the coding. Somehow I suspect that the bones are a bit harder to recover from. They take a lot longer to knit than a stent takes to settle in. * She finally managed to slow down this weekend. We had a nice Lyn relaxing day on Saturday wandering around Auckland Zoo for 5 or 6 hours watching the people and the other animals. Yes I am learning more about the identity situation as I go along but being fairly new to this Blog world I wish there was a ‘Whose Who’ and ‘How To’ guide available! Getting there gradually. Glad to hear the people /animal watching entertained you and your Lyn and that she has had some quality time out! Well deserved by the sounds of it. Facing ones mortality up close can not be underestimated…so I do admire your work ethic. I supported my husband through a shattered femur and ankle after a car accident 3 years ago. He was back at work after 6mths ( had been warned it could take 9-12mths) of challenges but determined effort. Trevor could be sidelined for a while but is of the head strong nature that probably means he will recover sooner rather than later. After all there is an election to win! Ooh look A politician who can ride his bike better than he can do his job in parliament.. The FAQ is the how to. The About gives an idea about the site. The policy tells you roughly what you cannot do and what we will do. Okay and can you point out to me what Trevor Mallard has done in parliament this year or for the past 3 years in fact thats actually useful. And as a labour supporter I am disapointed that he and Ruth still occupy seats, that really should go to younger and more dedicated to the overthrow of the NACT corruption squad that runs this country. Now banish me if you like as this is MY personal view. Mallard and Dyson Should have been demoted to the backbenches 18 months ago at least. And if it had been Key or English that had broken their leg/arm/whatever then my comment would have been funny. Deadly, you’ve mistaken LP’s reply to LynW as being a warning to you on behaviour, which, thinking about it, is actually funnier than your ‘joke’. Yeah he’s great in the house, that’s why the righties hate him so vocally. The more they complain about him, the more I want to see him lead the party. Huh? Oh I see – this is a threaded comment section. I was replying to LynW not to you D.
One of the points about moderating on this site is that we do it in bold and bracketed something like this. …….a pensioner needs your bed……..
ouch.. get well soon… I guess he doesn’t bounce like the tour de france riders do when they come off their bikes. Can we do funny comments on this? I imagine you could only do better than HS’s dimwitted effort below. Mend well and quickly, Trev. Yes TM, speedy recovery to engage in the upcoming battle. Having just had stiches out for a bike accident a some days ago it certainly brings your mortality that much more into focus. C’mon Keyster, get the cycleway through my neck of the woods so I don’t have to use the road. let go and let god trev.